This hearty Oxtail Soup Recipe is thicker than a soup, but not quite a stew. Rich and full of veggies, you are going to love this flavor! 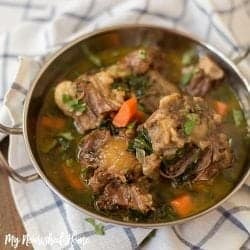 Recipes like oxtail soup and other stew recipes are my favorite simply because the cleanup time is next to nothing when everything cooks in one pot! If you are a skeptic about the concept of oxtail, don’t panic! It tastes like beef <— because it is just a cut of beef. Oxtail has more fat and gelatin than other cuts of beef, so it makes an incredibly rich broth. And because it is stewed until it breaks down, the beef is super tender. Okay, so most of us don’t rush out to buy oxtail at the grocery store, much less plan an oxtail soup recipe in our weekly menu. My husband and I have an evolving mission to try new things just because they are new… A fantastic side effect is that our kids often eat things that are super weird without knowing that they are super weird. They also go through phases where they only want cereal 3 meals a day... But we have high hopes for balance at some point in their lives. The cook time on this recipe is right around 3 hours so it makes the perfect Sunday evening meal. Sometime mid-afternoon, prep the ingredients and let it cook right up until dinner time. It is rich and hearty and makes the whole house smell good. My kids love this oxtail soup recipe — which I would have never dreamed! They have absolutely no idea what it is… to them, it just tastes like a rich beef stew. Since they enjoy the meal so much they don’t ask, so we don’t tell! This recipe is like stew, but not quite a thick. The consistency is somewhere in between regular soup and stew. I love to cook this recipe on a cold night and spend time with the family watching movies. It is perfect for a cozy night in like that! Hearty oxtail soup is rich in flavor and full of veggies too. 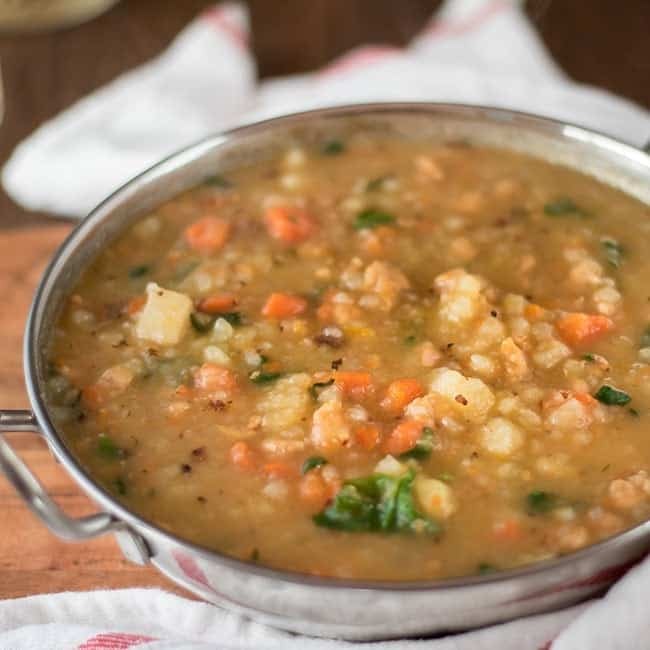 It is heavy enough to be a comfort food that will fill up the whole family with a healthy dose of veggies. Make sure you make enough to plan for a second meal. 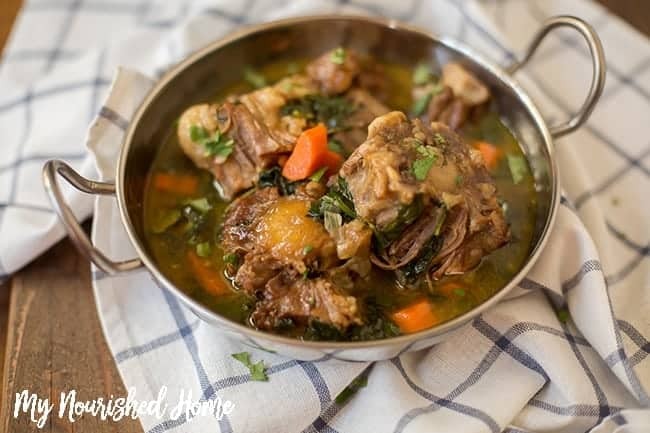 We like to stretch this oxtail recipe by serving the second meal over egg noodles or rice. You can even serve it two nights in a row, one night as soup and the next served over noodles, and no one will even care that it is leftovers. Sunday stew becomes Monday’s easy dinner. This oxtail recipe is actually really easy and comes together fast, then you just leave it in the pot until everything merges and the meat is fork tender. Salt and pepper four pounds of oxtail generously on each side. In a dutch oven over medium heat, drizzle olive oil all over the bottom and brown all sides of each oxtail. Once they are all brown, remove and place them in a bowl. Add the onion and garlic to the pot, saute until soft and translucent. Return the oxtail, plus all the juices that have collected in the bowl, into your dutch oven. Add the spinach and kale and pour in the beef broth. Cover, bring it to a boil and then reduce heat. Let it simmer for 3 hours. Once the meat is tender and falling off the bone, toss in the carrots and cook until they are soft. This dish is thicker than most broth-based soups but not as thick as stew. I love this stew just like it is on a cold day. But it’s also delicious over rice or with egg noodles. 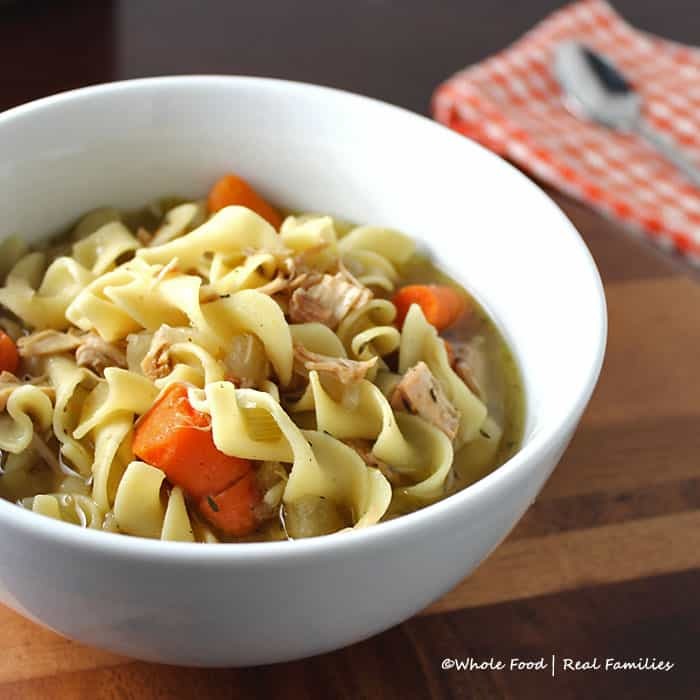 Try this Slow Cooker Chicken Noodle Soup. It is so easy (and delicious!) All you have to do is pile things in the slow cooker and turn it on. We also love this Sausage and Chunky Potato Soup! It is so easy and perfect for cold weather!!! Season oxtail well on all sides with salt and pepper. In a dutch oven (or large pot), drizzle olive oil all over the bottom and brown all sides of each ox tail. Once they are all brown, remove and place them in a bowl. Add the onion and garlic to the pot, sautee until soft and translucent. This dish is thicker than most broth-based soups but not as thick as stew. I love this stew just like it is on a cold day. But it's also delicious over rice or with egg noodles. Think adding mushrooms and frozen cauliflower would be good? Both sound delicious to me! Especially the mushrooms. can I add cabbage ? YAY!! I love it too! I’m going to try this tonight… although I’m a little hesitant about kale. Anything I could sub ? You can always sub with spinach that tastes a little milder. Or if you want to give the kale a go… strip out the stems because they are a bit more bitter. Or use Lacinato kale. It has blueish flat leaves and is much milder than the other varieties.